Drink Vodka, Eat Pickles, Repeat: Mastering The Zakuski Spread : The Salt Zakuski are like Russian tapas. More than a delicious snack, these dishes also tell the story of Russia. From "Herring Under a Fur Coat" to pickled everything, zakuski teach us about harsh winters and state-sponsored products in the Soviet era. Zakuski tables, like Slava and Luba Frumkin's, are known for their largesse. This spread includes smoked salmon and halibut, pickled green tomatoes, salted mackerel, Herring Under a Fur Coat and Georgian eggplant rolls. As you gather with friends to watch the Olympics this weekend, why not prepare what they might serve in Sochi? Try, say, herring instead of chips. But if you're really presenting food the Russian way, you'll need to make more than one snack. And get your libations in order. Zakuski are often described as Russia's answer to tapas — a little bite to have with your drink. They can be as simple as salted herring, or as rich as blini and caviar. Traditionally, when you welcome guests in from the cold (whether from the Moscow streets, or from the hundreds of miles it takes to travel to a country estate), you give them a warming shot of vodka. And to protect your stomach and palate from the harsh vodka, you quickly follow it with a bite of zakuski. "You do not exhale, and you immediately eat something to kind of stun the taste," explains Anya von Bremzen, author of Mastering the Art of Soviet Cooking. "A shot of vodka, a little pickle, a little herring canapé." And the dishes on the zakuski table don't just provide a delicious snack. In a sense, they tell the story of Russia. There are pickles of all sorts — green tomatoes, apples, mushrooms, cabbage — a nod to the food preservation that kept produce available during the long Russian winters. The zakuski table also expanded during the Soviet Era — as new republics entered the Soviet Union, new flavors arose. There was the bright cuisine of the more temperate Caucasus — full of walnut sauce and fresh herbs for those with enough connections to secure them — and the Baltics, from which canned sprats are now a fixture on many zakuski tables. The Soviet Era was also the era of mayonnaise, which brought several mayo-blanketed salads to the zakuski table, as the state promoted this new industrial product — salads like the appealingly named "Herring Under a Fur Coat," or Salat Olivier. Von Bremzen is quick to point out that the tangy Russian-brand mayonnaise, Provensal, is much tastier than its American brethren. There were also canned foods, including cans of hard-to-get items. Laying out zakuski wasn't just about food. In a sense, it showed who you were, von Bremzen notes — especially during Soviet times. "We had no housing to speak of, we had no cars to speak of, we all wore the same clothes," she says. "So the way you could actually show status, power, hospitality — a whole host of emotions — was through food. Through making this lavish zakuski table." And lavish is definitely the right word. Go to a Russian party, and you will be treated to zakuski after zakuski, fit onto a groaning table with Tetris-like precision. At a recent evening outside of Portland, Ore., Bonnie Morales struggled to fit the zakuski onto her parents' table. "Every single time, it's like we're not going to fit all this on here," Morales says with a laugh. "It's kind of embarrassing if there's tablecloth visible." 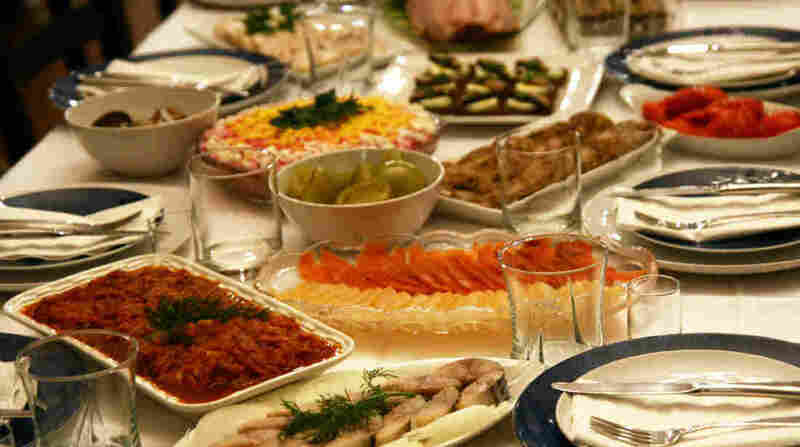 The assortment of dishes is standard for a zakuski party, but staggering for an untrained audience. Blini with butter and caviar; Salat Olivier; pickled green tomatoes, plums and apples; smoked salmon, halibut and black cod; salted mackerel; brown bread toasts with egg and smoked sprats; salted mushrooms; Herring Under a Fur Coat; fish in tomato sauce; Georgian eggplant rolls; and canapé with sprats. And that's not counting the hot zakuski: piroshki stuffed with cabbage and golden raisins and pickled mustard seeds; blintzes filled with mushrooms; and pelmeni filled with farmer cheese. Although these zakuski are all delicious, they're almost just an excuse to fill your glass — which is an excuse to make toasts. Slava Frumkin, Morales' father, serves as the toastmaster, or tamada. With his poetic prompting, others also raise their glasses, lifting toasts to family, to the table, to visiting family and new friends — all with a few bites of zakuski in between. And, as the accordion comes out, Frumkin raises a final glass to Kachka — the zakuski restaurant his daughter and son-in-law are preparing to open in Portland. They hope it will bring the family zakuski tradition to a whole new American table.